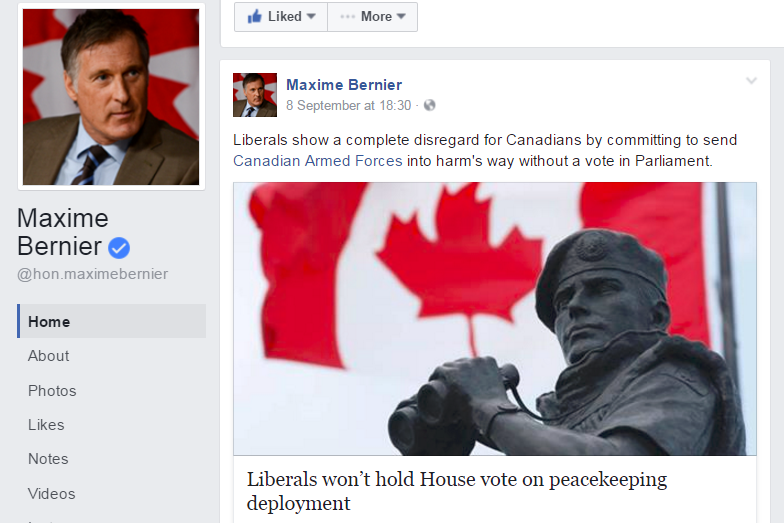 On 8 September 2016, Maxime Bernier criticized the Trudeau II government on his official Facebook group for having decided not to put the deployment of the Canadian Armed Forces to UN operations in Africa to a vote in the House of Commons. This misplaced criticism springs from a false premise that holding a vote on despatching the armed forces is axiomatically “democratic” and therefore good. In fact, it contradicts the principles of Responsible Government and the fact that the Canadian Armed Forces, like the civil service, are creatures of the executive accountable to parliament only through Ministers of the Crown. (I went into more detail on this subject in a previous entry, which you can read here). The Trudeau II government ought not to hold a vote on any military deployments because the authority to despatch troops properly resides in the executive. It is Cabinet that decides to send troops abroad through a variety of executive instruments (records of decision, orders-in-council, etc. ), and it is Cabinet that takes responsibility for those policies. In general, defence and foreign affairs fall under the purview of the executive because they are authorities of the Crown. Ultimately, the House of Commons can neither force Cabinet to act militarily nor stop it from acting militarily through a simple vote on a motion. If the Commons wanted to stop Cabinet from deploying troops, it would have to withdraw its confidence from the Government altogether. The Harper government set some bad precedents in this area that should not be followed. Bernier’s proposal is in fact a bad policy wrapped up in the auspices of democratic symbolism because it would allow the Trudeau II government to launder its responsibility over defence and foreign policy through the House of Commons and avoid taking responsibility for its own decisions. In other words, having the House of Commons vote on military deployments makes the Government less responsible and less accountable — which defeats the purpose of the House of Commons in general and Her Majesty’s Loyal Opposition in particular. Under Responsible Government, Ministers of the Crown are responsible for all acts of the Crown. But when the House of Commons votes on deployments — and ostensibly authorizes them or is perceived as having made the decision or given a mandate itself –, Cabinet can later deflect any questions about its policy and decision by pointing out that the Commons itself supported it and that it does not bear sole responsibility. This is not merely a theoretical academic exercise; experience bears out this claim. The Harper government put the question of extending the involvement of the Canadian Armed Forces in Afghanistan to a vote twice, once in May 2006, and again in March 2008. In each case, the Harper government sought to exploits divisions within the Liberal Party within a minority parliament and, in essence, dare the Liberal Party to vote against a motion that it could deem a matter of confidence. (Even proponents of holding votes on military deployments acknowledge this). Phil Lagassé has shown that the Liberals made themselves a less effective official opposition on the issue of war in Afghanistan between 2006 and 2008 precisely because enough Liberal MPs had supported the aforesaid motions. Maxime Bernier keeps banging on about he “respects the Constitution“, as if libertarians held an ironic monopoly on the subject. By this phrase, he referring to the provisions that relate to the freedom of movement of labour and capital within the federation, and I believe that he’s also applied it to the division of powers between the federal and provincial orders of government laid out in sections 91 and 92 of the Constitution Act, 1867. But the Constitution of Canada includes uncodified conventions of Responsible Government and its separation of powers between the executive and legislature. To “respect the Constitution”, the executive and legislature should stop interfering in each other’s roles and functions. In contrast, the idea that the Commons should authorize military deployments is not a convention; rather, it is a cynical contrivance that governments have — dare I say? — deployed only when convenient and immediately dispensed with when inconvenient. The Harper government, for instance, opted not to hold a vote in November 2010 because enough Liberals would have voted against it in the hung 40th Parliament to defeat the motion outright, and possibly force the government’s resignation — not because it doesn’t possess the authority to despatch troops without parliamentary approval (it does), but because of the fallout of losing the gambit of putting that decision to an unnecessary and high-profile vote. But, when in the dying days of the 40th Parliament, all parties agreed unanimously to support Canada’s participation in the NATO mission to enforce a no-fly zone in Libya, Harper agreed to hold a vote. And, when their parliamentary majority assured victories during the 41st Parliament, the Harper government opted once again to putting the Canadian Armed Forces’ continuing participation in NATO’s mission in Libya in 2011 and the US-led campaign against ISIS in 2015 to redundant votes that exposed foregone conclusions. When the Prime Minister or Cabinet decides to put its decision to a vote in the Commons only when it knows that it will obtain a majority but refuses to hold a vote when it might lose and not obtain a majority, they are not adhering to any constitutional convention but instead to their own Machiavellian caprice and cynical desire to extract a political advantage. More fundamentally, Bernier and other proponents of this procedure have failed to explain what goal holding a vote on this decision to deploy the Canadian Armed Forces to UN peace-enforcing operations is designed to achieve and what deficit it is designed to remedy. If this motion would amount to a vote of confidence, then the Liberal majority will undoubtedly sustain the Trudeau II government, and the vote would be redundant. Alternatively, if it is not a vote of confidence, then it remains entirely a waste of time. Logically, votes on deploying the armed forces should be matters of confidence because they pertain to the expenditure of public funds, since despatching military assets and personnel costs money. But that does not seem to be what Bernier and Ivison are advocating. From what I can gather from John Ivison’s column in The National Post, they want to hold a vote not because it would propose a specific policy outcome (despatching troops or not despatching troops), but simply because holding a vote in the Commons is supposedly democratic. Yet the Canadian Armed Forces are already involved with the United Nations Mission in South Sudan, and, as this report from The Guardian shows, observing and reporting on this inter-ethnic conflict has become very dangerous — but the House of Commons didn’t hold a vote authorizing or concurring with the Government of Canada’s decision to commit troops there. Bernier and Ivison would probably assert that the Commons should have voted on Canada’s participation in this UN peace-enforcement operation, and I would counter with the fact that the Canadian Armed Forces have been involved in Sudan and South Sudan since 2004 without such a vote merely shows why voting on similar operations now would be entirely redundant and futile, because nothing has prevented the Commons from holding the Ministry to account over its decision to support that UN mission over the last twelve years. The House of Commons can and should hold the government to account through Question Period, the Standing Committee on National Defence, in take-note debates, and in proceedings on the budget and Estimates. But the Commons should not eagerly infringe upon Cabinet’s legitimate executive authority and its own ability to hold the government’s policies to account. Indeed, since Bernier, Ivison, and the Globe and Mail can’t offer a compelling reason why the Commons should vote on military deployments beyond the presumption that doing so is axiomatically good and democratic, a take-note debate would be best, because the Commons could then discuss the issue without claiming to authorize the Cabinet’s decision. Minister Sajjan quite rightly pointed out that Cabinet — not the Commons — shall make the decision to deploy the Canadian Armed Forces abroad, whether in UN-sanctioned peace-enforcement operations in Africa in an effort to distance itself from the previous government and bolster Canada’s standing for when a non-permanent seat on the UNSC becomes available, or whatever. Let’s leave that which legitimately belongs to the executive to the executive and stop disrupting the balance of the constitution. Philippe Lagassé, “Accountability for National Defence: Ministerial Responsibility, Military Command, and Parliamentary Oversight,” IRPP Study no. 4 (March 2010): 16. This entry was posted in Cabinet's Powers, Crown (Powers and Office), Separation of Powers. Bookmark the permalink. “Ironic monopoly” is my new favourite phrase. Certainly when it applies to libertarians, since monopolies are anti-free market! I’ve noticed that Canadian libertarians have imported this “respect the Constitution” rhetoric from the Paulite libertarians in the United States, particularly after Ron Paul’s second campaign for the GOP nomination in 2012. They maintain this arrogant pretense that only they know the true interpretation of the Constitution of Canada, yet they don’t in fact understand it.